"The Supernatural is the Natural, just not yet understood. " There are many unsolved mysteries when it comes to the paranormal. The topics of spirits, ghosts, and other entities from beyond the grave have appealed to mankind all throughout history. Many believe that souls remain on earth even when the physical body has passed as a means of resolving unsolved business. Many believe that these spirits may not realize that they have physically died and are lost on our physical plane. Many have the opinion that ghosts wander along with the living in an attempt to pay penance to the acts and thoughts that they had while on earth. Many believe that spirits come in the form of angels and demons and are part of the never ending battle of good versus evil. Regardless of what form ghosts or spirits come in and why they are present, it is a fact that the living is not alone. There have been countless paranormal investigations, documented evidence in the form of ghost pictures, ghost videos, and even electronic voice recording equipment that validate the fact that ghosts are, in fact, very real. Here at Greatest Unsolved Mysteries, we feel that the mysteries of the paranormal world should be documented. Throughout the pages listed below, you will find a number of stories regarding those shadows that you observe from the corner of your eye, the misty figures that you may observe at an old historical sight, and hauntings that are believed to occur at various locations throughout the world. If you are interested in angelic presences, ghosts, poltergeists, shadow people , demonic presences, residual hauntings, intelligent hauntings, or stories that simply document the investigations into the spiritual world, you are sure to love our pages on the paranormal mysteries of the world. Be sure to bookmark this page and we will be adding documentation surrounding ghosts and hauntings on a regular basis. Share your story! We would love to hear from you! 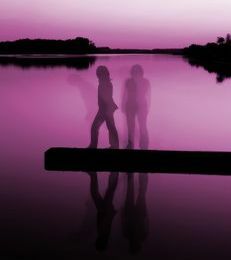 Shadow people are not quite ghosts but not quite human, they are not quite haunting, but they are paranormal. The mysteries surrounding the Bell Witch, in Adams, Tennessee, have captured the interest of many individuals. One of the most popular stories that pertain to haunted dolls is the one about Robert the haunted doll. The haunted places in Connecticut are considered to be some of the most mysterious real haunted places in America. There are many unsolved mysteries directly pertaining to the paranormal. Examples include stories surrounding the shadow people, spiritual entities that seem to be attached to an individual or location, eerie disembodied voices, and even inanimate objects – such as dolls – becoming seemingly possessed by a spiritual entity. In this section of Greatest Unsolved Mysteries, you may share the details of the paranormal encounter or experience that you have personally encountered. Remember to include as much detail as possible. Including details surrounding your paranormal experience is really useful to other readers! A Visit From my Grandfather?